I am sooo excited to announce that Re-Covered Treasures has been accepted into 3 juried Holiday Bazaars this year (and awaiting to hear about a 4th)! 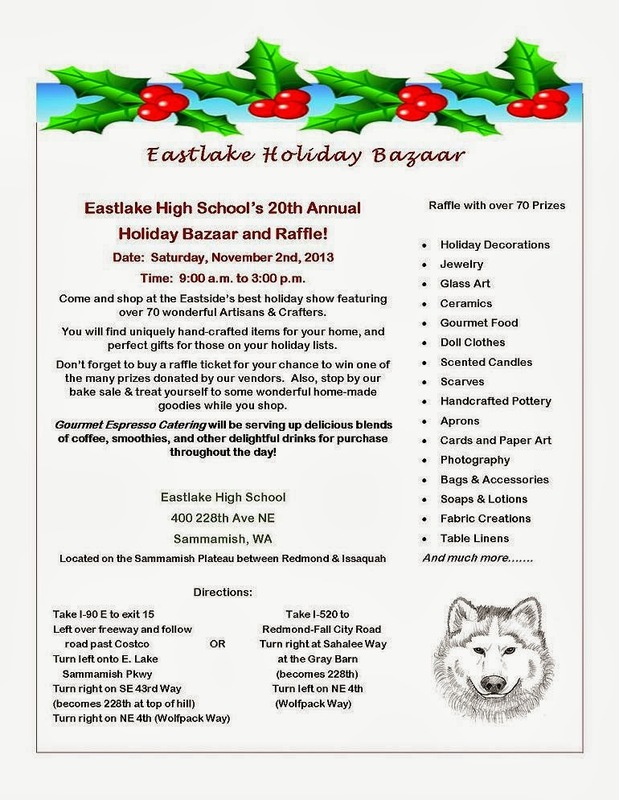 Our first bazaar will be the Eastlake Holiday Bazaar & Raffle on Saturday, November 2nd, 2013 - from 9am to 3pm. Located at Eastlake High School, 400 228th Ave NE, Sammamish, WA. I found this bazaar by accident last year and LOVED it, so I am SUPER-excited to be able to participate in it this year!! FYI - all the businesses that participate (including Re-Covered Treasures) are required to donate a raffle item to help support the PTSA and school ... so stop by and grab a raffle ticket (there will be a LOT of neat raffle items!!). 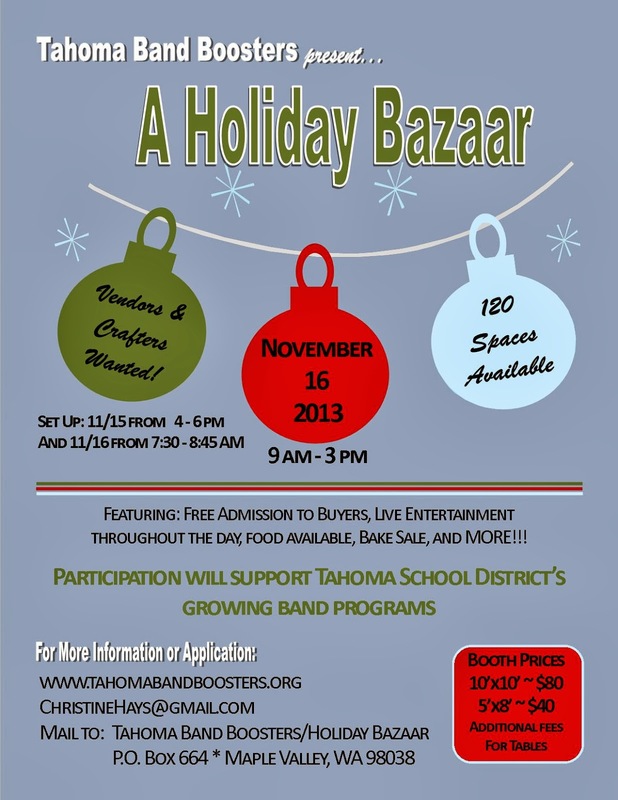 The second bazaar we'll be attending is the Tahoma Band Boosters present A Holiday Bazaar on Saturday, November 16th, 2013 - from 9am to 3pm. Located at Tahoma High Senior High School in Covington, WA. I haven't been to this bazaar, although I did attend a technology conference there and had a great time - so I have high hopes for the bazaar! 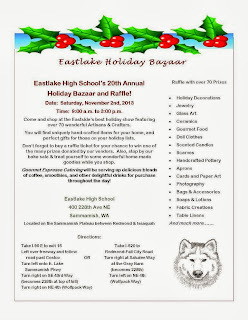 There is also a raffle at this bazaar - so another chance to win items from Re-Covered Treasures and the other vendors! 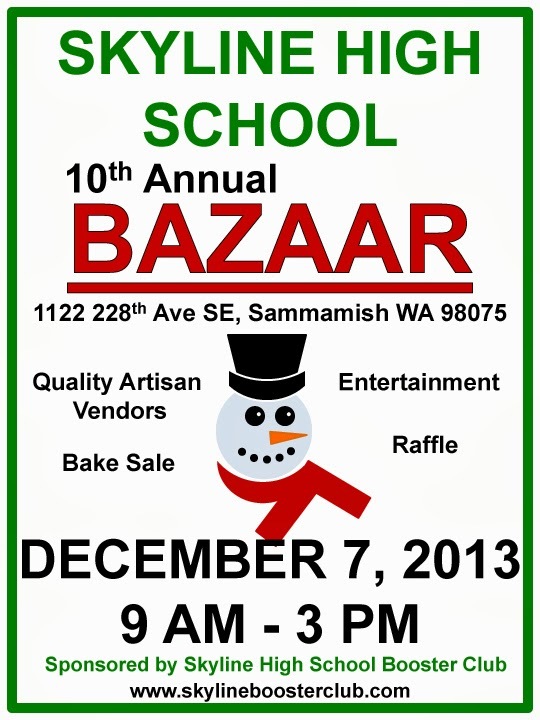 And our final bazaar for this year will be the Skyline High School Bazaar on December 7th, 2013 - from 9am to 3pm. Located at Skyline High School, 1122 228th Ave SE, Sammamish, WA. A great location and the perfect time to get holiday-related gifts!! 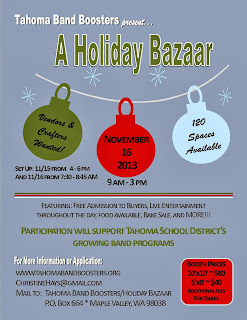 - And yet another raffle and chance to win items from Re-Covered Treasures and other vendors! 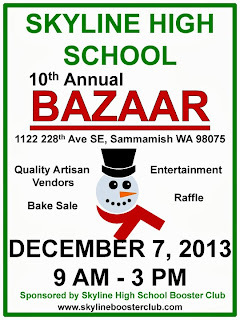 Please feel free to stop by and say hello to me if you come to any of the bazaars! I'd love to chat with you and find out what you think of our booth and of the bazaars in general! Now I'm off to begin working on all the ideas I have for upcycled items to sell at the bazaars! TTFN (that's ta ta for now)!